CAN NOT SEE ABOVE FLASH ANIMATION? DOWNLOAD LATEST FLASH PLAYER HERE. - Optional platter of fruit garnishes for cocktail decorations to impress your guests is $30.00 inc GST extra. We can leave backup mixture for your machine and you pay only if you use it. 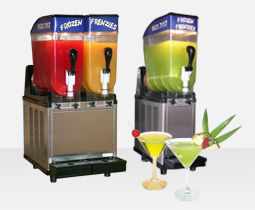 The cost for a 10 litre container of fresh fruit based cocktail mixture is $50.00 inc GST which gives you approximately another 70-75 cocktails. Cocktail Glass option also available for hire - 50c inc GST each. Plastic cocktail glasses are available to purchase for 50c inc GST each and are yours to keep and use again. 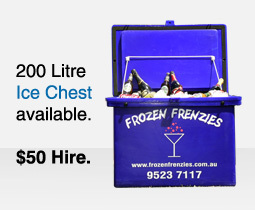 We can also supply you with a premix 10 litre container of cocktail mixture (excluding alcohol) for any function. So go on make your next event the talk of the town!